Happy Monday my friends! We have enjoyed some beautiful weather here over the past several days. I don't know what happened to the hot, hazy, humid August heat we normally endure, but I am loving these gorgeous breezy, sunny days in the mid 80's. I only wish I had more time to spend outdoors instead of in front of the computer. This summer has been filled with work rather than play. When hubs is home at dinner time, instead of at school or work, we eat together and then take a family walk or bike ride. Those are my favorite evenings and some of my favorite family memories. The kids seem to be growing up so quickly (we have two more birthdays this month! ), and I know these days of togetherness won't last forever. Here's a shot I took with my phone last night while we were riding. Not a perfect image, but a perfect moment nonetheless. What a great tradition of a meal and a walk. You kids will cherish that. These cooler days have been a little nice! Oo I love that tradition, we used to do as a kid when it was nice out! Gorgeous shot! Yes, this is a gorgeous shot! Great picture. I love the black and white. It's nice to have that family time as you are right they do grow up quickly and some of the best moments are in family time. Unfortunately, it's true. It seems like you blink, and they're all grown up. 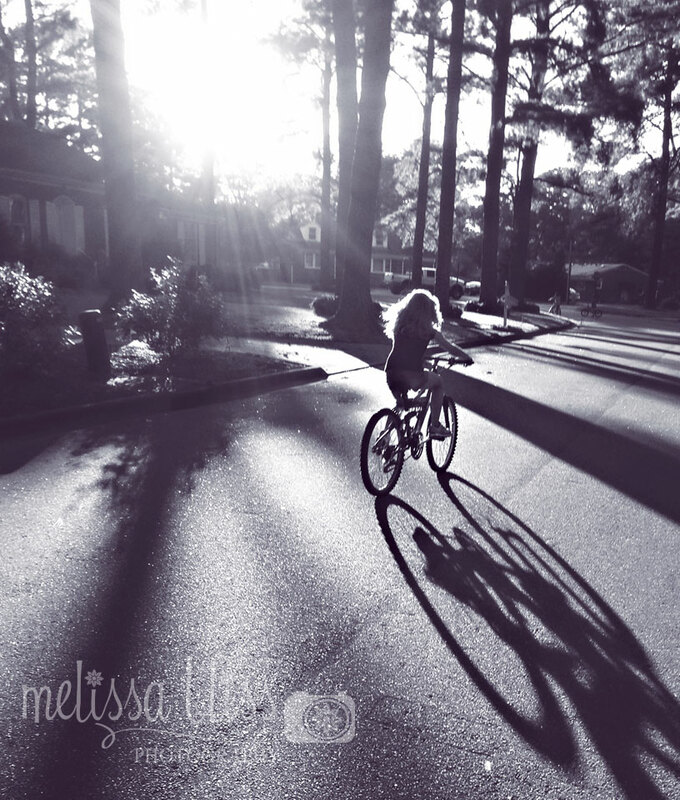 I love this photo, Melissa. The light is gorgeous. Looks like a perfect image to me- Love it my friend. The perfect representation of summer. I love this shot!